In June our second group of Grade 8 Students participated in the State Exams and graduated from the ALDS. They are anxiously awaiting the results, which will decide if they can progress to Grade 9 at the government school next year. We are of course sorry to see them go, but delighted we were able to give them the opportunity to progress this far in their education. We will continue to support them in what way possible. We wont have a graduation class again for four years. In the mean time we will examine the possibility of providing grades 9/10 at the ALDS for students graduating in 2022. During the months of June and July students from two Vincentian Secondary Schools in Dublin joined us: St. Vincent’s Castleknock and St. Paul’s Raheny. 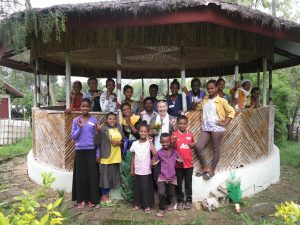 Each school spent two and a half weeks in Ambo facilitating a summer school for all the local children, teaching them English and maths and generally having some fun. 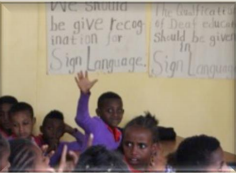 A significant highlight of their time in Ambo was the opportunity to go to the Deaf school where our students took time to teach them Ethiopian Sign Language. "This is the little video David Foley, one of the boys from Castleknock made of his trip to Ambo. 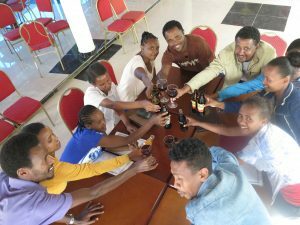 This year the Irish Association in Ethiopia chose the ALDS to be one of the beneficiaries of the annual St. Patrick’s Gala Ball. It was a wonderful evening and an opportunity for us to let people know about the needs of Deaf people, the work of the school in Ambo and to celebrate the very close connection between Ireland and Ambo. Eileen, Fionnuala and Angela. Two of Fr. 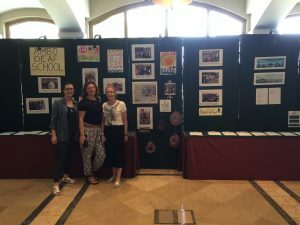 Stephen’s sisters and a good friend helped put together a display for the Patrick’s Day Gala Ball highlighting the work of the ALDS. Recently the Ambassador to Ethiopia, Ms Sonya Hyland presented a cheque for over €8000 to the school (proceeds from the Ball) Fr. Stephen’s two sisters and a friend were visiting him at the time and helped to put together a display highlighting the work of the Deaf School. They also had a great evening celebrating with over 600 guests who had paid to attend the Ball. We are keeping our fingers crossed that the ALDS will be chosen as beneficiaries again next year…. Our students were delighted with their bright new uniforms. With so many new students coming to the school, we decided to update our uniform to something a little more colourful and uplifting… the students were delighted with the new colour. Having 52 students leave the school each day and head down dressed as smartly and brightly as they were, caused a bit of stir… that they were signing and smiling made an even bigger impression. In Ambo each school is clearly defined by its uniform and there is no mistaking ours! Celebrating the graduation of our grade 8 students. Our first group to take the government exam. We celebrated the first group of students to participate in state exams and to graduate from the school. The students are now in Grade 9 at the government school. However, they are struggling to adapt, as they do not have the necessary back up, support and understanding. Unfortunately we are not in a position to offer education at these grades, as it would require the building new classrooms, employing new teachers and upgrading our facilities. 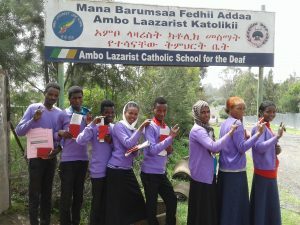 We have arranged to offer the teachers, staff and students at the government school a course in Deaf Awareness Training and to offer any teachers who might be interested to participate in an Ethiopian Sign Language course. 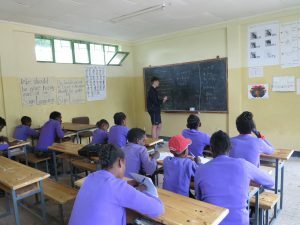 (In May and June we arranged for the teachers at the ALDS to provide tutorials for the students as they prepared for their grade 9 exams). Teaching maths to our pre-school children. Ms Margaret Farrell, a retired teacher for the Deaf from Dublin returned to the to the ALDS to volunteer for a second time. 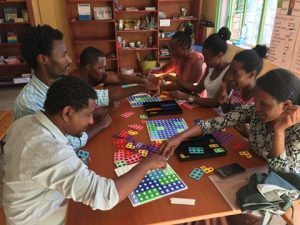 She spent over three weeks at the school teaching in the mornings and In the afternoons, she facilitated a wonderful series of workshops, introducing the teachers in both the Deaf School and the Kindergarten school to the ‘Numicon’ method of teaching maths. A kind benefactor in Ireland had donated a complete set of Numicon aids to the school. We used ‘Lydia’s Space’ for the workshops and it proved to be ideal for allowing the teachers interact and engage with each other She also introduced our older students in Grade 8 to Circular Weaving. Indeed it could be said, that Margaret has now woven herself into the hearts of the students and teachers here at the ALDS. Numicon workshop for the teachers. For those rural Deaf children not lucky enough to have the opportunity to attend the school we organised a ‘Rural Outreach Program’. 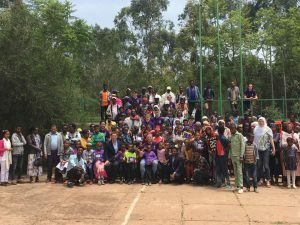 We invited the children, their parents and social affairs employees to visit the Deaf school and participate in a day of fun and learning. It proved to be a huge success and was repeated five times during the school year. Again, it was a privilege to be able to observe so many children arrive at the school; nervous and a little overawed by the welcome they received from our students. 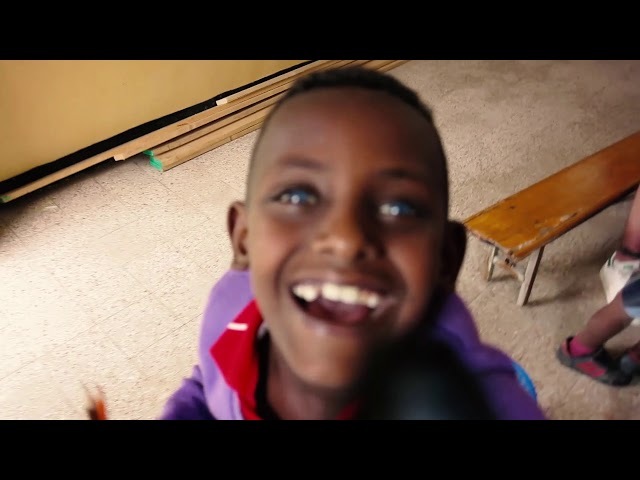 However, they quickly began to see themselves reflected in our students, could see that there was a means of communication that was accessible to them and were soon fully involved in playing some sports, trying to learn a Sign or two. Rural outreach program: Children and Parents gather for a lesson in sign language. However, another vital part of the program was the opportunity to meet with the parents of the children and facilitate them in discussing their concerns about their Deaf child, the problems they encounter in the local community, their exclusion from education etc. All of them agreed that having the opportunity to come to the school had really opened their minds to the potential their child possesses. They were intrigued to see the students who are already attending the school display just how capable they are when given the proper support in learning. A boarding facility at the ALDS would allow so many of these children the opportunity to prove their own abilities. Fiona Broderick and her husband Matthew attended our final rural outreach day in July. Fiona works at the Irish embassy in Addis. 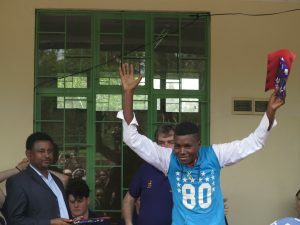 The embassy have been very supportive of the school. Ababoo celebrates his graduation from ALDS 2018.